Posted by Its spring! And with the weather (finally?) warm enough to put our flowers, herbs and veggie plants out without fear of a freak snowstorm (then again this is Alberta and we have super fickle weather), it also means its usually getting a bit warm to want to cook in the kitchen. So here's a quick and refreshing recipe that's perfect for when its warm out!Jicama, also known as a Mexican yam/turnip can be found at most Asian or Carribean grocery stores. Its getting so popular that I actually found it at a regular grocery store! The outside waxy and thick fibrous skin is inedible and needs to be peeled off (I hacked it off with a sharp knife as my potato peeler wasn't cutting it (literally!). Inside is a white, slightly sweet interior. Jicama usually is eaten raw or can be sautéed - regardless if you cook it or not, it retains a crisp refreshing texture similar to biting into a juicy unripened pear and a good source of potassium and vitamin C. This recipe I was inspired to make after noshing on some lettuce wraps at Congee Queen in Toronto. 1) In a small bowl combine lean pork (or other diced protein) with the loysauce, white wine, cornstarch and 1 teaspoon of oil. Let it sit and marinate to come up to room temperature while you prep the veggies. 3) On medium high heat in a non-stick wok or deep frying pan, heat up 1/2 teaspoon of oil and sauté the pork for about 3 minutes stirring every now and then, until there's a nice sear, pork is cooked through and is no longer pink. Set aside. 4) Into the pan, add in remaining 1/2 teaspoon of oil, add in garlic, ginger and chills if using for about 1 minute or until fragrant. 4) Add in the onions, celery and carrots, cook for 2-3 min until soften. Add in sweet peppers, jicama and cooked pork. 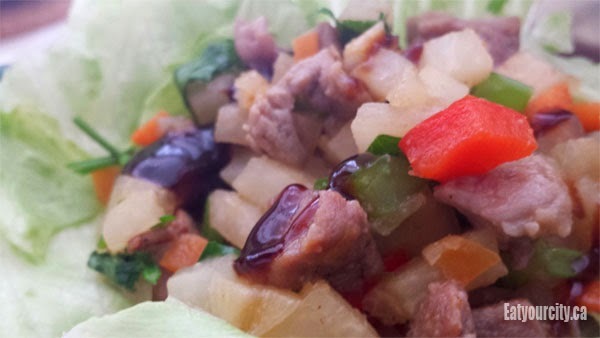 Mix well and serve immediately with lettuce and hoisin sauce.